If you use pesticides, at some point you will need to dispose of unwanted pesticide, excess spray mixture, pesticide-treated products and seeds, or waste materials containing pesticides or their residues. Excess pesticide and rinsates that cannot be used must be handled carefully, and many pesticides must be disposed of as hazardous waste. Other pesticide wastes include contaminated soil, spill cleanup materials, and personal protective equipment (PPE) that cannot be cleaned and reused. The pesticide user is responsible for the proper care of pesticides or pesticide-containing items until they can be properly disposed of. Failure to store such materials safely and dispose of them properly may result in serious harm to people, animals, and the environment. It may also result in legal action and penalties. Never dump pesticides or pesticide wastes on the ground, into or near water, or into storm drains, or septic tanks. 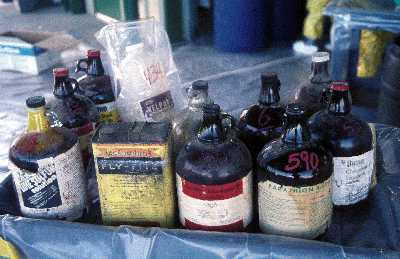 Any pesticide intended for disposal or collection must be in a correctly labeled container in good condition. Always wear proper protective clothing and equipment when handling pesticides or pesticide wastes. How to Store, Handle, and Dispose of Agrichemical Pesticides. Paul Guillebeau and Mark Risse. University of Georgia Cooperative Extension Service. Circular 846. Pesticide Disposal. Illinois Pesticide Safety Education Facts and Updates. North Carolina Agricultural Chemicals Manual. NC State University.